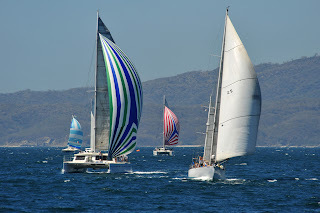 Over 30 competing vessels from all categories and classes will participate at the International Banderas Bay Regatta taking place in Riviera Nayarit, the day before the beginning of the official activity program of the Tianguis Turístico México 2012. The 20th edition of this get-together regatta will take place on March 20 – 24 in Riviera Nayarit, and it has already become the most important event organized by the Vallarta Yacht Club in Nuevo Vallarta. The program for this year includes a welcome party on March 20, a practice round on the 21 and competitions on the 22, 23 and 24. The opening parade taking place on March 22, at 11:30 am will be especially appealing, as the public will be able to enjoy this event from the entrance of the Nuevo Vallarta Sur beach. The International Banderas Bay Regatta is a non-profit event. One of its key objectives is to promote this sport, so captains are encouraged to invite young sailors to be part of their crews, as many of them are already part of the Youth Sail Program of the Vallarta Yacht Club. Experts consider Riviera Nayarit as one of the best destinations for sport sailing due to the consistency of its wind currents, which have allowed our destination to host the Regata Copa Mexico twice. Additionally, a number of nautical sports can be enjoyed here year-round, and our destination offers modern marinas, fiberglass specialists, and professionals that can fix all the gadgets found on a ship, as well as extraordinary touristic services. The Convention and Visitors Bureau (CVB) of Riviera Nayarit congratulates all members of the Vallarta Yacht Club for their constant support to promote our destination, through the creation of international events like International Banderas Bay Regatta, which contribute to promote and attract visitors to our destination.